Next week, at SIHH 2017, Swiss independent watchmaker Christophe Claret will officially unveil a new timepiece with a so-called “memo” function. Basically, a cone-shaped display made of aluminum, between 3 and 4 o’clock, which features a diamond and two natural rubies (red) or two natural sapphires (blue), depending on the version, pivots one way to remind you that you need to do a certain task each day, and the other way to show you that the task has been done. It is reset by pressing a pusher on the side of the case. 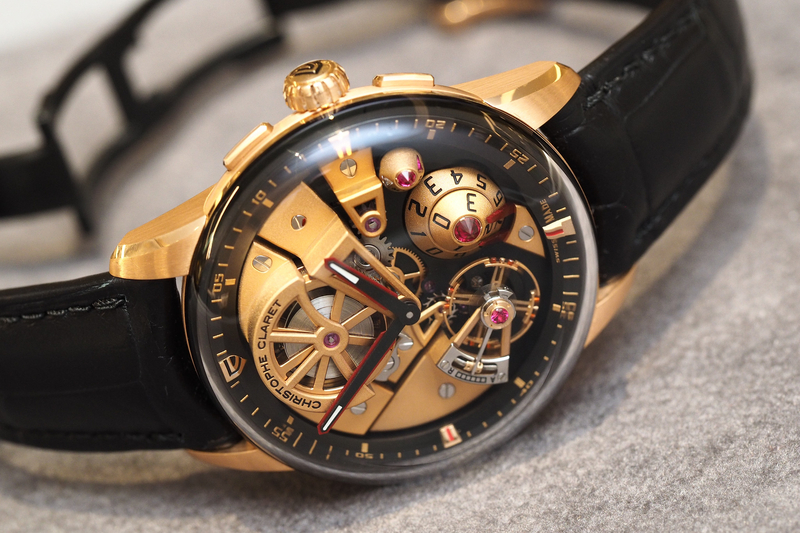 The inspiration, according to Christophe Claret, comes from the expression “tie a knot in your handkerchief” to help remember something important. Additionally, there is a dual tier cone-shaped aluminum display at 5 o’clock that shows the date and is topped with a natural blue sapphire or natural red ruby. Technically, the display performs a semi-instantaneous jump between midnight and twenty past midnight. Seen at 6 o’clock, the balance-wheel, in blue or red, depending on the version, features countersunk screws, and has been entirely developed and produced in-house. Concealing the shock-absorbing system is a natural red ruby or a natural blue sapphire, which is interesting in that most watch jewels, including the other 29 jewels in this watch movement, are made of synthetic sapphire crystals (there are 33 jewels in total, 3 are natural rubies or sapphires, and 1 natural diamond). The case measures 42 mm x 16.06 mm and is available in either grade 5 titanium, with blue accents, or in 5N pink gold with red accents. 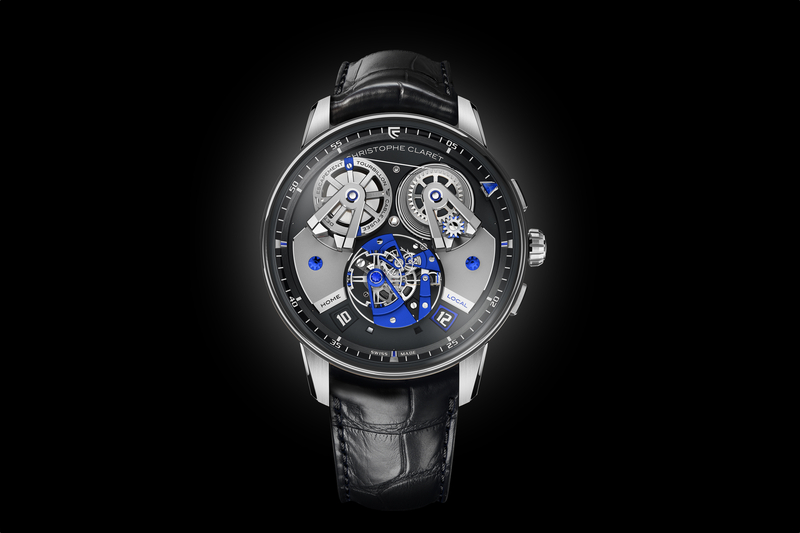 Protecting the dial side is a massively domed sapphire crystal, which both acts as the bezel and offers an incredible view of the entire dial that reveals the main components of the movement. 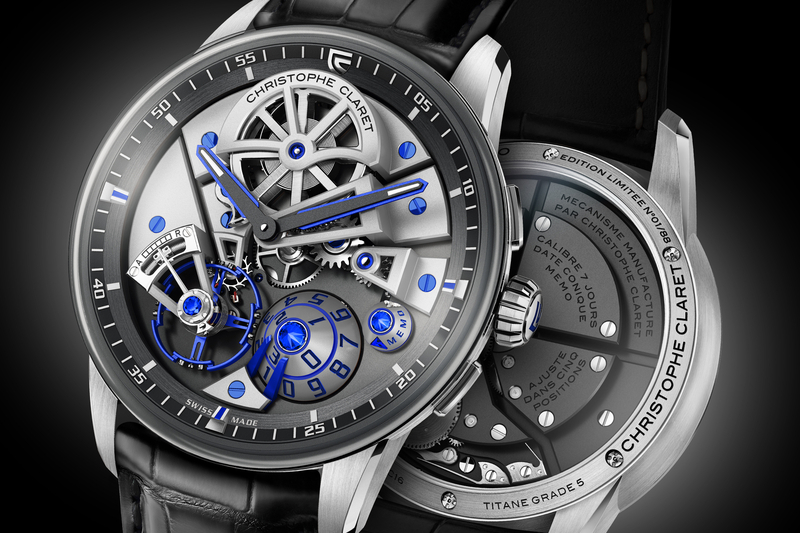 From the visible two series-coupled barrels at 12 o’clock, that ensure optimum power for 168-hours (7-days), to the perfectly finished Charles X style bridges, that boast 26 difficult to produce interior chamfered angles, to the blade spring at 8 o’clock, that displays the level of power reserve remaining, the finishing is immaculate and available to view at a glance at all times with no need to take the watch off and flip it over. The back has a sapphire crystal as well, and you the darkened, frosted bridges are nicely finished, but this watch is all about the dial side. 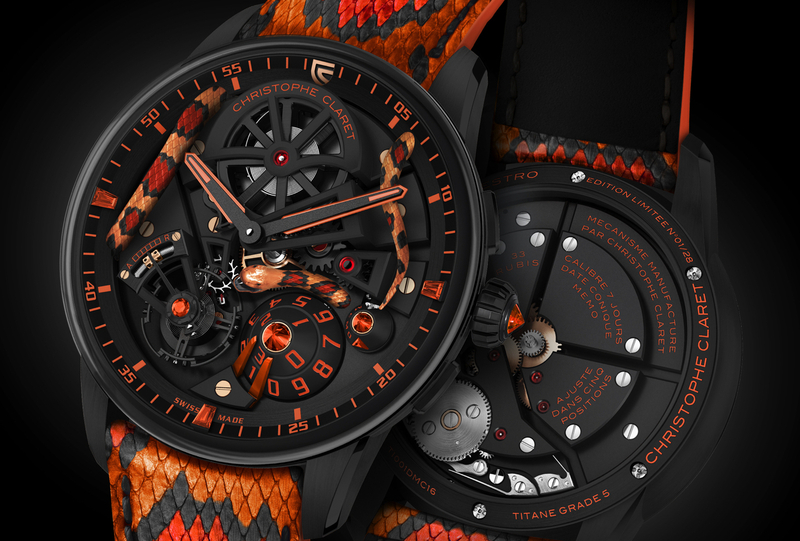 A set of two-tone hour and minute hands, a signature design of Christophe Claret, and a mixture of matte and polished surfaces, along with either red or blue accents, complete the look.